This pressure switch is used to control the on/off of the Aquatec booster pump 6800 series and 8800 series. Typical application is installed on a RO reverse osmosis water system. Instruction is included inside package. This switch has 1/4" inlet and outlet quick connect fitting. All you need to do is to push in a 1/4" OD tubing into the inlet and outlet all the way in, the fitting will seal itself. To remove the tubing, you just need to push the plastic ring firmly against the fitting then you can pull out the tubing. 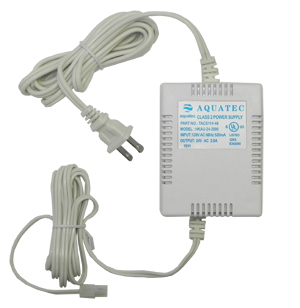 Operation: When the pressure switch is connected to a Aquatec pump and Aquatec transformer, it will turn on the pump when pressure switch is sensing below 40 psi; then it will turn off the pump when the pressure is sensing 40 psi or above.